Should Newcastle United try for this French forward in January? Words by Kevin Doocey on December 24, 2013 . In a recent interview with a dominant French paper long-term Newcastle United target Bafetimbi Gomis confirmed that he plans on leaving his current club on a free transfer in June of 2014. Graham Carr, the scouting team and Joe Kinnear all hoped to conclude a deal for the French international in September but meddling agents and seemingly extradordinate hidden fees meant the proposed £6m move fell through despite Gomis’ desire to move to St. James’ Park. The 28 year-old has already netted seven times this season in Ligue 1 & I must say that I’ve watched quite a bit of Lyon this season (mainly because of outstanding talent that is Clément Grenier) which had led me to the conclusion that Gomis is not particularly suited to Newcastle United. His style is quite laborious and powerful - perhaps the very reasons that Newcastle wanted him this season, who knows. The reality of the situation is if Alan Pardew and club want Gomis in January to bolster their forward line, they can have the Frenchman for a nominal fee of about or less than €1m - a ballpark figure that equates to the rest of his contract at the Ligue 1 side. 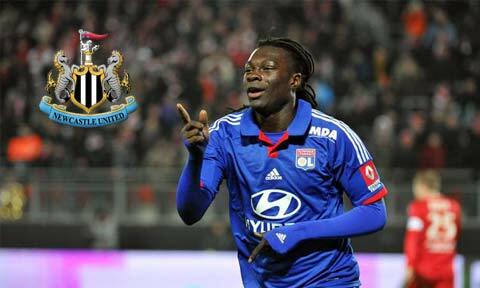 The real question is - do we try for Gomis in January? Our forward line needs reinforcing to maintain our good league form, but whether Gomis is the man we need is another issue. The talk of the ‘blueprint’ that is in place at St. James’ Park would surely render this potential deal a no-go one would think? Ultimately we need another striker in the New Year and there is talk of interest in Inter forward Ishak Belfodil - a young Algerian international has - similar to Gomis - strongly hinted at an exit in the coming transfer window. Ideally Newcastle United would try sort a permanent deal for Loic Rémy in January to avoid any summer commotion, and it is likely that Pardew will try lure Wilfried Zaha on loan for the remainder of the season but we need permanent faces in the New Year. This season has gone in a very similar fashion to the season in which NUFC finished 5th in the Premier League, however this time the club needs to push on and show some ambition. It will all fall down to Mike Ashley and whether he feels like trying his luck to bring Newcastle United onto the next level or rather - per usual - he opts to keep his ‘investment’ ticking over. Time will tell, but I have a good idea of what will happen, don’t you? Comments welcome as always folks, and a Happy Christmas to you all!